History of the Camp – KZ-Gedenkstätte Vaihingen/Enz e. V.
It was in 1942 when the German armaments industry grabbed for Vaihingen for the first time when experiments with the catapult of the V1 (project name Fi 103) were carried out in the quarry of the Baresel company. While doing so Vaihingen served as an outpost of the research institution “Graf Zeppelin” of the Ministry of Aviation which had been established in Stuttgart – Ruit in 1941. Heavy blocks of iron which replaced the missiles were shot from an original Heinkel catapult against the wall of the quarry. During these experiments the speed as well as the progression of pressure and acceleration inside the catapult were measured and recorded automatically. The knowledge about the quarry which was isolated and bolted towards the valley of the River Enz persuaded the “Jägerstab” which was established on March 1st 1944 by the Ministry of Aviation and the Ministry of Armament and which amongst other things planned to relocate important parts of the armament industry under ground to site one of six main bunkers in the Reich in Vaihingen. It was intended to produce parts for Messerschmitt aircrafts on an area of about 80 000 square meters there. Already in April the Organisation Todt (OT) began to establish the construction site with the alias “Stoffel” in the quarry and in the nearby fields. 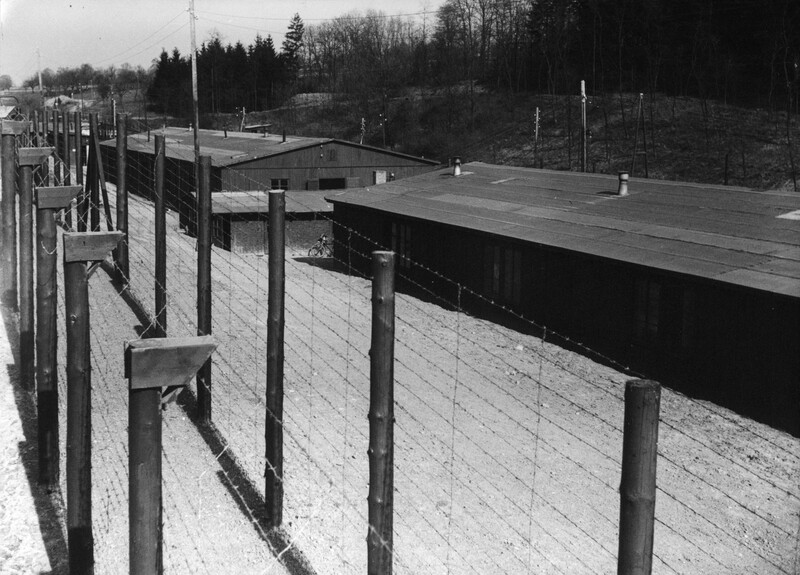 Simultaneously several barrack camps developed in order to take in material as well as equipment and to accommodate OT workers in the “Egelsee” and alien employees in the lower Glattbach valley. On May 6th the camp and construction site was cordoned off covering a wide area. Farmers needed a pass in order to work their fields. As a satellite camp of the concentration camp Natzweiler in Alsace a work camp for concentration camp inmates who were exposed to “extermination by hard labour” was established in the upper Glattbach valley. On a site of 80 to 180 meters the Organisation Todt erected four wooden barracks, a barrack for ill inmates, a simple lavatory and a convict kitchen all surrounded by double barbed wire. Friedrich Berlinghof was the chief of the camp. Wilhelm Lautenschlager was the commander of the SS – guards in Vaihingen as well as in Kochendorf, Hessental and Unterriexingen. After chief of the camp Berlinghof had been posted to Guttenbach at the end of September Lautenschlager succeeded him. He also remained commander of the guards which was unusual. On August 9th the transfer of 2189 concentration camp prisoners from Auschwitz to the construction project “Stoffel” took place. The prisoners exclusively were Polish Jews from the concentration camp Radom/Poland who had been evacuated on July 24th. They had been selected on the ramp of Auschwitz and classified as being able to work. 2187 arrived in Vaihingen on August 11th – two had died on the transport. Because they were in a run-down and louse-ridden condition they were taken to the transit camp in Bietigheim and were subjected to a washing and delousing action before they were taken in the concentration camp Vaihingen which the local population trivialized by calling it concentration camp “Wiesengrund” in an ironic way. Already on September 7th at the request of the Lord Mayor of Vaihingen 24 prisoners were sent for and brought in to build air raid shelters in Vaihingen. From then on they remained present with the population of Vaihingen as well as with the inhabitants of Kleinglattbach where there was a command working on the “von Neurath” manor. 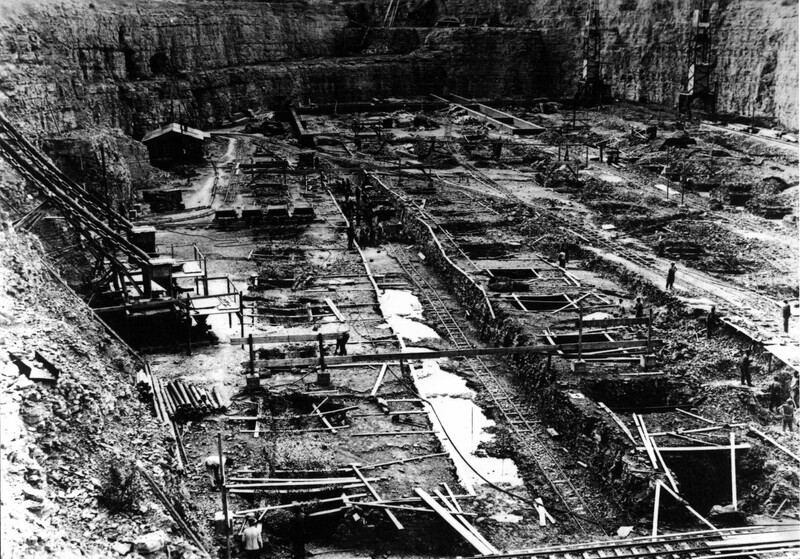 The construction site of project "Stoffel"
At the end of October the construction work in the quarry had to be stopped because of heavy allied bombing and the camp was transformed into a ”SS hospital and recreation camp” which was its official function beginning on December 1st. At the same time a fifth barrack was added to the camp. Since October 15th most inmates were distributed to other projects and camps in Hessental, Dautmergen, Bisingen and Unterriexingen. Afterwards 178 inmates being unable to work still remained in Vaihingen. Another 200 were employed in the quarry doing cleanup work. 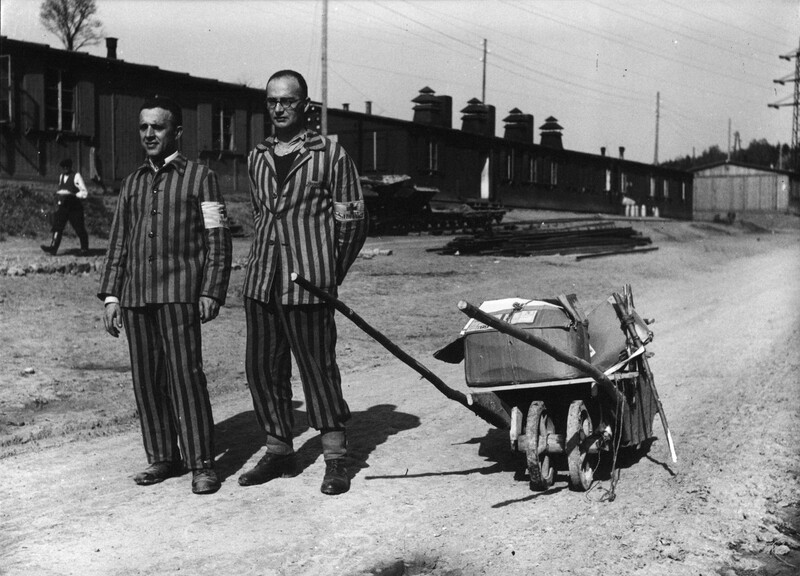 On November 10th the first transport of seriously ill concentration camp prisoners arrived from the so-called “Wüste” camps. Amongst them were Russians, Poles, Frenchmen, Italians, Greeks, Belgians, Dutchmen, Norwegians, Germans – finally people from more than 20 nations were in custody in the concentration camp Vaihingen. They were left to their fate with completely insufficient nourishment in unheated barracks. The German camp doctor Dichmann was not interested in their condition at all. Even after two convict doctors were transferred from Neckarelz in January 1945 the situation did not improve because they neither had devices nor medicine. When on February 16th typhus was introduced by a transport from Haslach an epidemic broke out which demanded up to 33 dead daily and which transformed Vaihingen into a death camp. The last of the 25 transports reached Vaihingen on March 11th from Mannheim – Sandhofen with 144 convicts. In the beginning of April the order was issued to evacuate the camp. Those being able to walk were sent to Dachau via train transport. In Dachau 515 men were listed. On April 7th the camp was liberated by French troops. 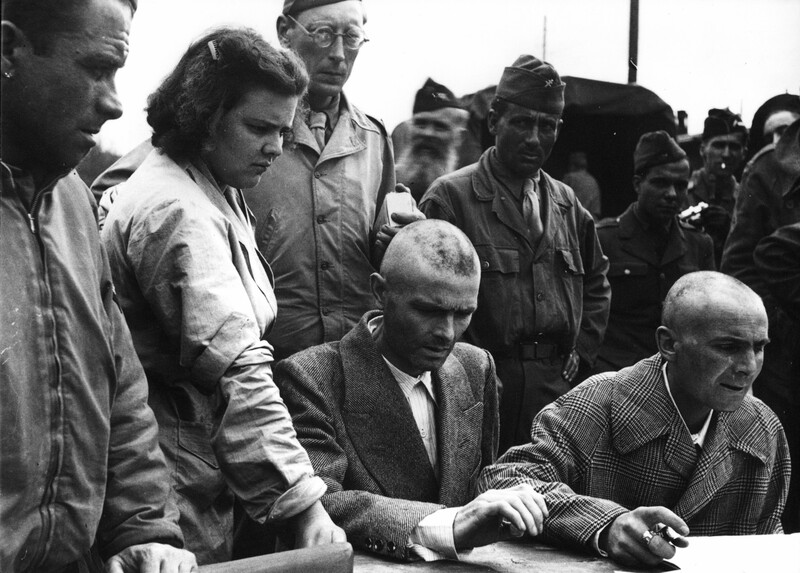 French medical officer Dr Rossi reported about 650 survivors remaining in the camp in Vaihingen. They were evacuated promptly: On April 9th and 10th French, Dutch and Belgian ex-inmates were brought to Speyer. On April 13th the Polish, Russian and German ones were transported to Neuenbürg near Bruchsal and quarantined off until the beginning of June. 128 former inmates who were not transportable were admitted to the hospital in Vaihingen. Another 60 men coming from Neuenbürg joined them. Until the end of 1945 84 of those ex-inmates died and were buried on the Vaihingen cemetery. Immediately after the evacuation of the camp on April 16th the barracks were burned down because of the danger of plague. 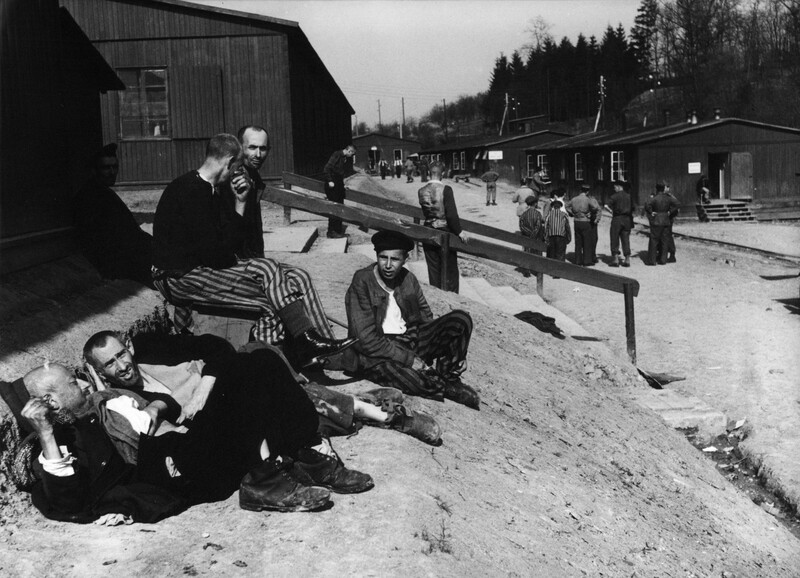 The SS – men from camp Vaihingen were mostly apprehended by the occupying powers, arrested and questioned in Dachau. On November 22nd 1946 the US Americans handed over members of the SS – guards to Poland where they were taken to court in Radom a year later. Möller, one of the cruelest SS – men, appeared in court in Lublin and was sentenced to death. In October and November 1947 a trial took place in Rastatt against 42 former members of the SS – guards of the concentration camps Vaihingen, Unterriexingen, Hessental and Kochendorf that were all in command of Lautenschlager. It was in front the French court “Tribunal General”. Eight of the accused were discharged but 10 were condemned to death – among them six SS – men from Vaihingen like Dr. Dichmann, Pospischil, Pill (the boss and cook of the convicts` kitchen) and Hecker who was an infamous SS – guard in Vaihingen. Lautenschlager was sentenced to slave labour for life. Already in October 1945 the City of Vaihingen had to build a concentration camp cemetery on the site of the common graves. From March till September 1954 however the graves were opened by a French commission. All in all 1488 corpses were exhumed. While examining the mortal remains 223 dead could be identified and transported to their home countries. The mortal remains of the other victims were buried on the concentration camp cemetery which was established between 1956 and 1958. First damage and scribbles happened shortly after its opening on 2nd November 1958. More desecrations followed in 1990, 2003 and 2005. Voices of protest were lifted against these atrocities not least of all at the commemoration ceremonies which have been taking place since 1977. The Norwegian government commemorated their dead with an impressive ceremony in 2005. Since then these victims have been commemorated by a plaque.